India Value Invest: Age of Capital Destruction - Dance like it is 1999 in India? Age of Capital Destruction - Dance like it is 1999 in India? 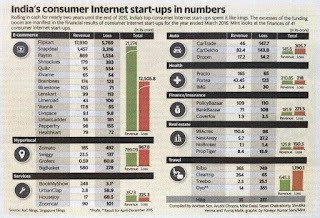 This is a post not related to investing or stocks but more about the bubble going on in the startup world in India. I will talk about some companies but there is no offence intended towards them. Everyday you see bigger and bigger numbers coming up for investments in startups in India. The article Indian Startup Funding Report mentions that there were 815 deals with $3.5 B invested in first 9 months of 2016 compared to 639 deals with $7.3 B invested in same period in 2015. This shows that the amount has come down but the deals have increased. I don't have the financials of most of the companies but let's look at some numbers. 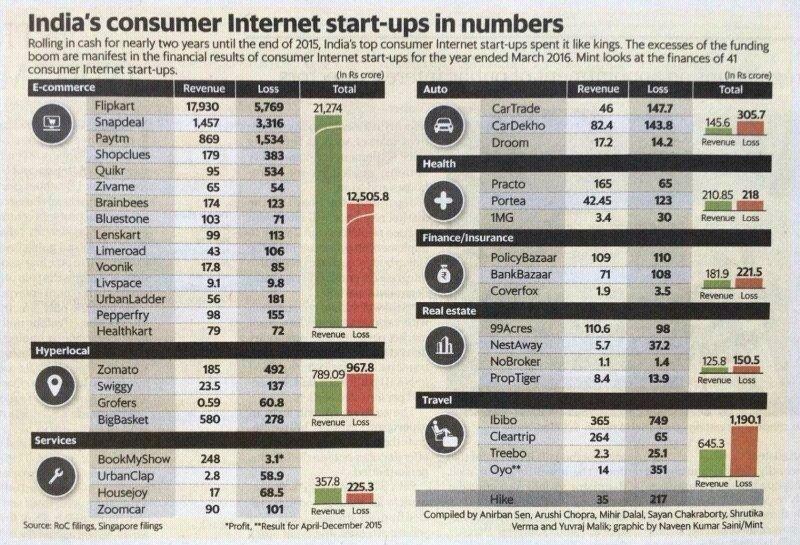 The following figure shows the bleeding consumer startups in India. Of all the companies, the only one that is profitable is BookMyShow. All the others are making losses. There are some publicly listed companies such as Infibeam, which are in e-commerce space and are profitable now and investing in right companies such as its recent investment in payment gateway, ccAvenue. With such large clients, the revenue of the company in 2015 was INR 711,721. Yes you read that right, it is not USD, it is INR. So the company earned $11K kind of revenue from Clinton Foundation and NASA, that is 2 years in operation since company was founded in 2013. Let's look at the expenses which are INR 11,828,771. 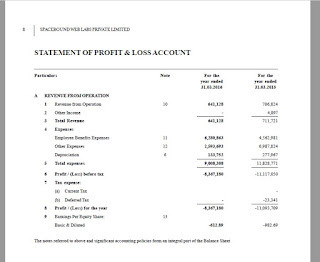 Yes you read that right, it is $170K out of which almost INR 4,562,981 went for paying 8 employees their wages (including founders). There were some extraordinary legal expenses due to merger in that year but even in FY16, numbers haven't improved much (revenue has gone down rather). The second company Fantain Sports' financials are available here. It's balance sheet shows that the company's subscribed capital was INR 28 lakh till 2015 but it has increased to 2 Cr 10 lakh in 2016. The company's revenue increased from INR 10.28 lakh in 2015 to INR 41.19 lakh in 2016. At the same time total expenses rose from INR 22 lakh in 2015 to INR 1.01 Crore in 2016 resulting in losses for both the years. 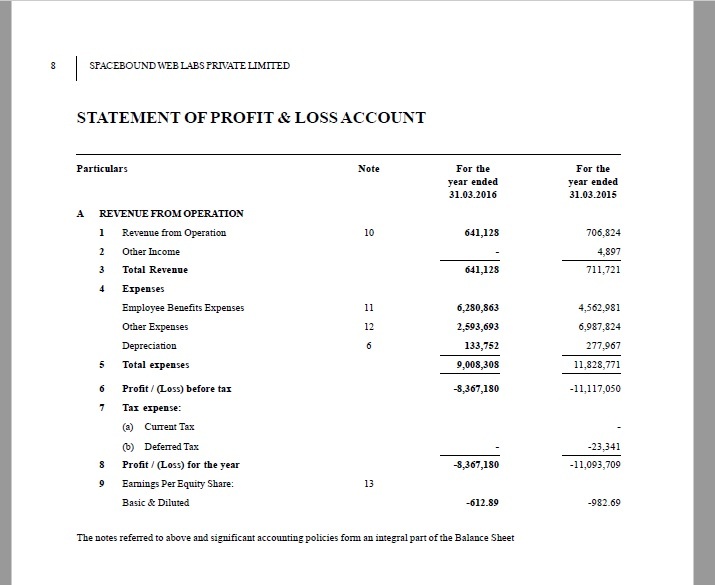 The financials of this looks better than that of Eventifier. Apart from tax credits, I am not sure what benefits BookMyShow is going to get. This clearly shows 2015 was a scary year for startup investments in India. Similar stories would appear 5-7 years down the line when people would talk about large scale capital destruction that happened during these years. Please make sure you protect your capital rather then getting any return on your capital. Salil, which company you are talking about? The current time in commodities looks same as that of 1999 when oil, metals, etc... all went down in prices. I feel 10 years down the line you will again see good times in prices for the commodities. Boric Acid also falls in commodity cateogry. Company is available at 20 crore if you remove net current assets. What else you need? great thanks Chinmay. Good observation. can you please tell us rationale for buying ufo moviez stock?